Users like to see the big picture, and often that includes items they’ve selected as well as what they haven’t selected. Check boxes are interface widgets that meet these needs, but they can be cumbersome to maintain. Chris Weber shows us his technique for creating dynamically generated check box lists that don’t require intervention by the developer when the possible selections change. One of the downfalls of using check boxes and option groups is that the user interface needs to be updated (read “redone”) whenever the choices change. For example, check boxes used for a distribution list of departments that receive a memo would have to be updated whenever a department was added, deleted, or renamed. So, when I see an interface that uses option groups or check boxes, I see work down the road. The options invariably expand or the selections change. I’m grateful for the work, but I also take pride in the solutions I provide. I don’t think the way to ensure my future employment is to create non-scalable interfaces that need reworking when my client’s business changes.The upside of option groups is that users see all the choices available, and they see what they’ve selected, and they see what they haven’t selected. That’s true, provided the option group is up-to-date—that is, implemented with the current selections in mind. In every case where an option group is used, a combo box that dynamically provides the most current choices can replace option groups in your UI. Not only will it save you work down the road, it will save you space on your forms. The downside is that users need to be familiar with the contents to know what wasn’t chosen. Alternatively, a single-select list box also provides the current choices and reveals both the selected and non-selected values. The same arguments don’t hold true for a group of check boxes, which imply that the user can select none, one, or multiple choices. Combo boxes are never multi-select. An extended list box, however, can provide the same functionality. Unfortunately, for child lists like a memo distribution list, a list box needs to be programmatically updated for each parent record, as well as for each insert and delete. And, as far as some users are concerned, holding down the Ctrl key to make or remove selections is non-intuitive and cumbersome. Lastly, in a many-to-many relationship like memos and departments, it’s impossible to let users select combinations of departments and memos unless the relationship already exists. Well, it’s not impossible, as you’ll see. On a recent project, my client insisted on a checklist of departments for the distribution of documents. They wanted check boxes that their users could tab through, and the list of selections was about to change with a reorganization of the departments. The relevant data structure is shown in Figure 1. Initially, I didn’t see a problem. 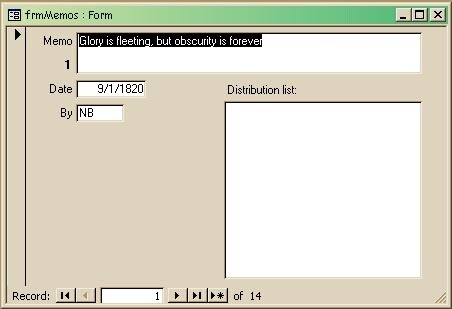 I told my client that I’d just use a list box that has a true/false field in it that reflects the existence of the key value in the memo distribution list. But, I discovered, Access list boxes won’t display check boxes for true/false fields. They simply display a 1 or 0, and that wasn’t acceptable to my client. I created a very simple mock-up of the interface (as shown in Figure 2), and began to mull over my options. You can see the void where the dynamic check box distribution list should be. As I talked myself through the problem, I realized that the list my client wanted was really a union of two lists. The first list consisted of what was selected—that is, those records in tblMemoDistribution whose MemoIDs matched that of the memo of interest. The second list consisted of those departments in tblDepts whose DeptID didn’t appear in tblMemoDistribution with the MemoID of the current memo. That second list is really a not-in query of the departments not in the first list. This query returned all of the departments, regardless of whether or not they were selected. The problem was, there was no way to tell from the list whether the department was, indeed, selected. Then I found my solution: I’d fill both queries with the same fields and convert the MemoID (where it existed in tblMemoDistribution) to a Boolean that could then be displayed as a check box in a subform. I saved this query as qunn_fsubDeptMemo. The output of the query for a MemoID of 1 (the record shown in Figure 2) can be seen in Figure 3. The first column gives me my complete list of departments, the second gives me their DeptIDs, the third gives me my check box value (whether they’ve been selected), and the fourth gives the DeptIDs of just those that have been selected. I then built a subform to fill the void in my interface design. The subform uses just two controls: a check box for MemoID and a text box for Dept. And, as per my client’s request, I also added Select All and Clear All buttons. The resulting form is shown in Figure 4. MemoID isn’t actually a field in the recordset. Even if it were, not all the records would have one, therefore, the unselected departments would never show. So, I had a subform without linking Master / Child fields filled in. Back to the drawing board. In fact, all I’d built was a read-only form. I needed a way to update the underlying record(s) by having my user click on the check box. Unfortunately, I soon learned that the On_Click event of the check box wouldn’t fire because the underlying field wasn’t updateable. How could I check a check box when its underlying field locks the control? The answer was obvious: Don’t click the check box; click something else. 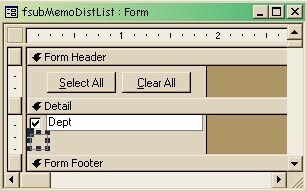 Figure 5 shows my subform, fsubMemoDistList, with an added transparent button that I moved directly on top of the locked check box. Now I can add my code to the button’s OnClick event to handle my selections. The code begins by trying to save the parent record. If the save fails, an error message in my error handler will inform the users what they must do to complete the Memo, and the routine exits. If the save succeeds, I then check to be sure a parent record exists. If the user is on a new record, nothing happens. Otherwise, the code continues and stores away the LookupDeptID of the current row into lngDeptID. 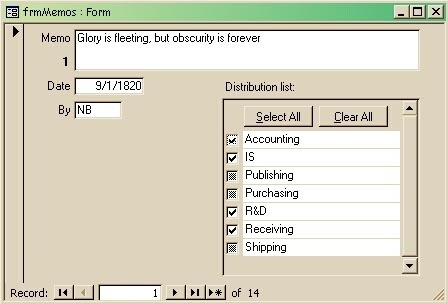 Unfortunately, the requery method moves the subform’s cursor to the first record and, if the list is very long, this scrolls the user back to the first record in the list. So, first I stop the form from painting—I don’t want the user to see this inadvertent scrolling. With quite a bit of extra work, my client got exactly what they asked for. Yes, it was a relatively expensive solution, but the client’s users see their information just the way they want it. More importantly, it’s a self-maintaining solution so they don’t have to call me back after their reorganization. Since this experience, I’ve reused the pattern throughout the application in many-to-many relationships so each additional implementation costs less than the previous. My client is happy, I’ve learned not to be bound by bound-forms even in a purely Access solution, and I can still take some pride in my work.